Editor's Note: The following true story illustrates not only an excellent self-defense technique, but it also brings into focus the competing issues of self-defense versus avoidance of excessive force. The author has contributed photos of this technique to help illustrate the story. Recently while a jujitsu (jujutsu) student, and assistant instructor in the art, was standing in line at a fast food restaurant, a second larger patron attempted to break in front of him to get to the counter. The student spoke up, saying that he was there first, and that they would be served shortly. The larger man backed off (returning to the rear of the line), but a few seconds later pushed ahead again, driving his shoulder into the student's back. This time student just tried to ignore the interruption. It didn't work. With his right hand he grabbed the student's right shoulder and attempted to turn him around. 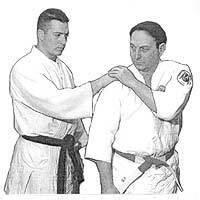 To avoid things getting out of hand, and not wanting to hurt the aggressor, the student responded with a simple jujitsu technique. 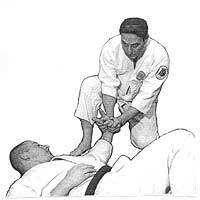 Without turning, the student placed his own left hand (across his body) on top of the attacker's hand (to hold it in place). Then, while turning slightly, he placed his right forearm (from the inside) on the attacker's right arm (an unbendable arm technique), and then rotated his body counter clockwise as he moved his right arm in a downward spiral. This took the aggressor to the ground, but didn't injure him. 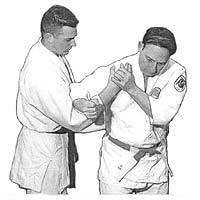 Then, to prevent retaliation, the student pinned the aggressor's wrist (wrist lock) in order to keep him from moving. While this was going on, a restaurant employee had telephoned the police. Upon arrival the officers started to arrest both of those involved. The student, however, told the police that he was just trying to get the attacker off him and then to restrain him until they arrived. Another restaurant employee also reported the facts of the incident that supported the students statement. The policeman replied that if the student had punched or kicked the attacker while he was on the ground, he would also have been arrested. The attacker was then arrested and taken to the hospital for observation and/or treatment of any possible injures. In any self-defense situation such as this, there are always legal questions, such as, when does excessive force begin in the eyes of the law? Everyone has the right to defend himself or herself, but when does the level of force exceed that necessary for self-defense? 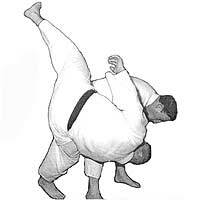 One limitation of karate, taekwondo and many kung fu styles that rely on punches and kicks is that the defender can easily be perceived to be the aggressor or having applied excess force. And if the defender strikes an attacker after the threat has ceased, he or she may end up arrested and possibly sued. 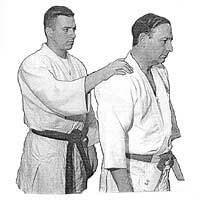 One advantage of Jujitsu techniques is that they are usually perceived by onlookers as well as law enforcement as a soft, non-aggressive defensive response. This can also minimize any civil legal consequence. As a side note, readers will be glad to know that the restaurant employees were so impressed with what the student in this situation had done that they gave him a free dinner after the police left.